How to Build an App in 5 Minutes! GoCanvas allows you to easily create your own apps for Android, iOS, and Windows PC. Today, I wanted to walk through a quick and simple example of how to do this in 5 minutes. This app will allow you to capture a digital signature on your mobile device in just seconds. Below, you can see what the result looks like on Android mobile device. We already have over 20,000 pre-built data collection mobile apps in our GoCanvas Application Store. Each of these can be customized, but in this article we are focusing on how to create one from scratch that can capture digital signatures. The goal of this article will be to walk through signing up for GoCanvas, building a simple mobile app which captures some simple information (first name and last name) and a digital signature, fill out the app on an Android device and view the results as a PDF document. If you aren't already a GoCanvas customer, sign up for free GoCanvas account. Once you sign up for GoCanvas you should receive an e-mail with a download link for your device. If you didn't get the email, you can go to http://www.gocanvas.com/m to download GoCanvas. Login to the GoCanvas website with your new login on your desktop computer to begin building your digital signature capture mobile app. Enter a name for the new app, let's call it "Sample Signature Capture." Click 'Save and launch app builder'. Drag a 'Signature' control from the left-hand palette. In the popup for the text input, enter 'Please sign your name'. The outline of your 'Sample Signature Capture' GoCanvas mobile application should look like the below screenshot. To add additional fields to your new signature app drag a 'Text box' from the left-hand palette. In the popup for the text box, enter 'First Name'. Drag another 'Text Box' control from the right-hand palette. In the popup for the text input, enter 'Last Name'. At the top of the GoCanvas app builder, click 'Save' and select 'Save and publish'. Once the GoCanvas app builder has finished saving, you will be prompted what users should have access to the new application. Make sure to check your login and click 'Publish'. Start GoCanvas on your Android device and log in using your e-mail and password that you registered with. Fill out the 'Sample Signature Capture' mobile app and once done, click 'Yes' to upload your submission. Click on the signature field, and sign with your finger or stylist. After the signature is captured you will see the box turn green as shown below. If you logged out of the GoCanvas website, log in again and click on the 'Submissions' tab. You will find the data you just filled out on your Android. You can now view it online, download it as a PDF, export it as a CSV/Excel file, or integrate it into a backend system. Hopefully the above example demonstrated how easy it is to go paperless with GoCanvas. 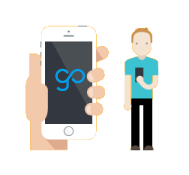 All of the applications created with GoCanvas work across all of the mobile devices we support. These include Android, Windows PC, iPhone and iPad. You can get rid of filing and data entry and save your business time and money. Interested in learning more about how you can automate your data collection? Visit our Tour Page and sign up for your FREE FOREVER account of GoCanvas today!